SAMMY HAGAR He is the multi-platinum Red Rocker, the outgoing, bombastic front man of hard rock champions Van Halen, the man who won’t drive 55, member in good standing of the Rock and Roll Hall of Fame, currently embarked on his fourth platinum career with his supergroup, Chickenfoot – the one and only Sammy Hagar. Son of a steel worker and onetime professional boxer, raised in hardscrabble Fontana, California, Hagar burst on the scene from San Francisco as the lead vocalist of Montrose, whose “Rock Candy” has gone on to become a certified rock classic. After a string of eight solo albums, culminating with the million-sellers “Standing Hampton,” “Three Lock Box” and “V.O.A.,” and hundreds of sold out concert appearances across the country, Hagar joined Van Halen in 1985 and took the band to unprecedented heights, including four consecutive No. 1 albums, before he was unceremoniously fired. He thrived as a solo artist with his band, the Waboritas, named after the Mexican resort he founded, the Cabo Wabo Cantina, home of the handmade, premium Cabo Wabo Tequila that Hagar oversaw from the first spoonful. He returned to Van Halen to lead a triumphant 2004 reunion tour. 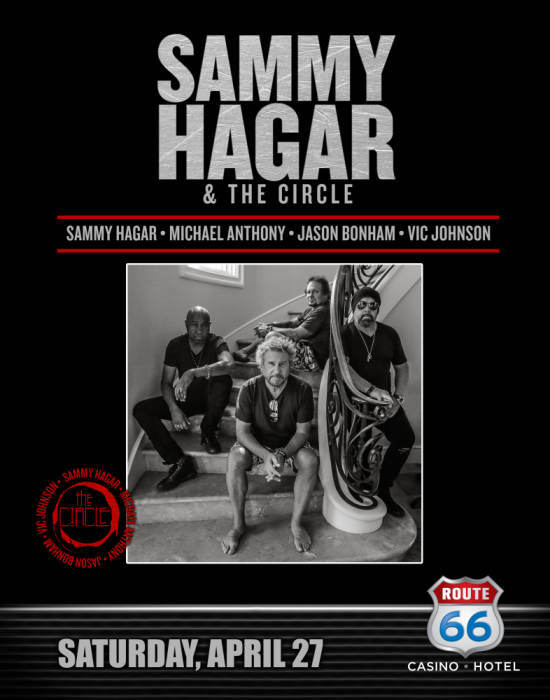 Hagar has played with a succession of genius guitar players; from Ronnie Montrose and Neal Schon to Eddie Van Halen and Joe Satriani from his current group, Chickenfoot, which also features former Van Halen bassist Michael Anthony and Red Hot Chili Peppers drummer Chad Smith. His songs have been covered by other artists, including Bette Midler and Rick Springfield, whose 1981 Top Ten hit, “I’ve Done Everything For You,” was written by Hagar. Other bands have written songs about him (Thelonious Monster, Nerf Herder). 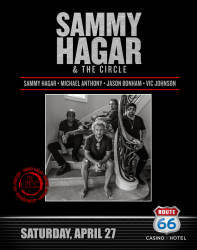 Hagar, who celebrates his birthday in epic fashion every year at his Mexican resort, expanded his restaurant chain with Cabo Wabo Cantinas in Las Vegas and Lake Tahoe and a series of airport restaurants, Sammy’s Beach Bar and Grill, that raise money for local charities.